Cycling in Guernsey is fun and safe. 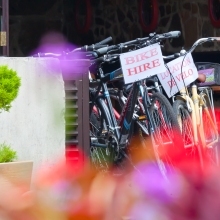 Create your own itinerary or follow Visit Guernsey’s cycling routes (get a leaflet) – brilliantly devised to lead you past most of the island’s attractions and beaches. Rent a bike from the many hire places, or come with yours if you travel by ferry, and enjoy the beautiful and ever-changing countryside where coasts and fields are neighbours, enough to take anybody’s breath away. Eleven cycling routes are signposted around the island, some circular, most leading from one to the other and all telling you about the local history, environment and folklore. Do a little homework before you get going so as to choose your route according to your schedule and fitness. Take advantages of les “Ruettes Tranquilles”, Guernsey’s country lanes where the speed limit is 15 mph and where priority is given to walkers, cyclists and horse-riders. The north of the island is sufficiently flat that a 10 mile cycle ride shouldn’t be too arduous. Forts, towers, German fortifications and neolithic tombs are all to be discovered in the parish of Vale. The west coast offers the quiet and beauty of the countryside mixed with the more bustling sandy beaches and rocky bays. Don’t miss the Folk and Costume Museum at Saumarez Park to get an idea of what life was like about a hundred years ago. Things will get a bit more hilly as one gets further south with the lovely but more demanding route through Talbot and Fauxquets Valleys. A watermill, a tiny chapel, the German underground hospital and Martello Towers are a few of the sites of interest, so take your time if you want to see it all. There is so much to see in the south, beside the cheer beauty of the coast and cliffs! Names such as the Fairy Ring or the Cup and Saucer will be found on a map, and reveal ancient circle of stones and a fort hosting Guernsey’s Shipwreck Museum. Again plan your time carefully as well as check the opening times of all the places that you intend to visit. Further east some of the most iconic bays such as Saints Bay and Moulin Huet Bay can be admired from atop, unless you fancy a steep ride down to the sea for a refreshing dip on a warm sunny day. The east of the island is dominated by St Peter Port which featured as Part 2 of our Guernsey Essentials. A cycle route from south to north exists too, taking you through five of the parishes and perfect for an overall view of the varied scenes to be admired around Guernsey. L’Ancresse Bay and Icart Point are the northern and southern points of that route – both names synonymous with relaxation for islanders…treat yourselves too! This entry was posted in Guernsey Activities and tagged Cycling in Guernsey. Bookmark the permalink.